Don’t get us wrong, Luka Modric is a great player and undoubtedly one of the finest midfielders of his generation, but what the f**k? The Real Madrid star has emerged as a somewhat surprise name to break up the Lionel Messi and Cristiano Ronaldo hold over the Ballon d’Or for the last decade, picking up the 2018 prize in last night’s ceremony. While Modric may be a worthy winner after a superbly influential year in which he played a starring role in helping Madrid win yet another Champions League final, whilst also guiding Croatia to a surprise spot in the World Cup final, one has to wonder if his victory will rub a few players up the wrong way. Hey, remember in 2010 when Wesley Sneijder was quite possibly the best midfielder in the world, won the treble with Inter Milan, and helped the Netherlands reach the World Cup final, only to lose by a single extra time goal to that legendary Spain side? Not even worthy of a place in the top three of the Ballon d’Or that year, apparently. Someone somewhere owes Wesley an apology. For all the ludicrous amount of trophies and world class midfield displays for many years, Xavi also never managed to break the Ronaldo-Messi stronghold on the Ballon d’Or. The best Xavi could manage was finishing third three years in a row between 2009 and 2011, which is admittedly better than Sneijder managed, but which also feels a little bit more like rubbing salt into the wound. And think of poor Andres Iniesta right now. He scored the winning goal for Spain in that 2010 World Cup final victory, which of course followed one of many superb seasons for Barcelona. And yet the Spaniard could only muster up one runner-up spot in the Ballon d’Or in 2010, and third place in 2012. Whereas Modric reaches one World Cup final and wins the thing. Surely the best player to never win this award? Thierry Henry was out of this world between about 2002 and 2006, but missed out in bizarre fashion on a couple of occasions. The former Arsenal striker somehow finished runner-up to Pavel Nedved in 2003 (yep, great player, but really?) and then didn’t make the top three again until 2006, when he finished third behind centre-back Fabio Cannavaro and goalkeeper Gianluigi Buffon. Truly, the World Cup has way too big a sway on who wins these awards. In 2004 and 2005 Henry didn’t even make the final three, despite Andriy Shevchenko winning one and the likes of Deco, Frank Lampard and Steven Gerrard being in the running. Never quite up there with the very finest players in the world, but to be fair Franck Ribery had a storming 2013. The Frenchman was immense for Bayern Munich as he played a starring role in their treble-winning season that year, but still couldn’t break past Messi and Ronaldo, finishing third. Anyone else noticing a pattern here? 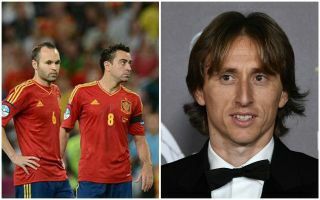 While Modric may have become the first non-Messi-or-Ronaldo winner since 2007, it’s still been eleven years since someone who didn’t play for Real Madrid or Barcelona won the prize.